This is one of the classic microscopes and equipped for geological examination makes it relatively rare. Finished in ‘signature’ classic black enamel, the general body work is excellent for its age with just two small chips to the large base. The stage does show the wear that would be expected with the examination of geology specimens. The chrome work is exceptional and the incident light path has polariser and analyser filters in very good condition. The base has the usual ‘Epi’ and ‘Trans’ lighting options that can be used jointly with the ‘Mix’ paddle This microscope is all original including the transformer box and 2 light bulbs are included. The large circular stage has a centre ‘pop out’ circle so that thin sections can be examined with transmitted lighting although there is no condenser present . The incident light path has a slide in/out polarising filter and a slide in/out analyser that can be rotated and crossed with the polariser through 90 degrees. A good set of 190mm tubelength dovetail objectives are included with magnifications x5, x11, x22, x32 and x60. The trinocular head has the usual part rotation and there is a lever to bring a camera into the optical path. A pair of widefield Reichert x6 eyepieces. The large circular rotating stage has lateral adjustment. This microscope is now a serious collectors item and as such is offered at a really competitive price. This is a new instrument and a new model that has been used only by ourselves for assessment purposes. A trinocular polarising microscope with an elegant design and a specification that is outstanding for its price range. Circular rotating stage with centring screws and a four position turret with three of the positions having individual objective centring. Achromatic 160mm tube length strain free objectives x4, x10, x40 and x60 with a pair of x10 wide field eyepieces and a third eyepiece with a focusing cross hair. The polarising filter is attached to the bottom of the substage condenser is graduated and rotates through 360 degrees. The analyser is on a push/pull lever which allows it to be crossed with the polariser and also to be removed from the optical path. Low position coarse and fine focus controls. Retardation plates and quartz wedge. This is an advanced specification trinocular polarising microscope with both transmitted and incident illumination systems providing both bright and dark field incident lighting and bright field transmitted lighting . The incident system is controlled by a stand alone 6v 50 watt transformer. Both systems have a double iris for Kohler illumination. The objectives are bright/dark field semi-plan x4 (0.10), x10 (0.25), x20 (0.40) and x40 (0.65) all being infinity corrected and non coverslip. The incident dark field is controlled by a central stop on a push/pull system. Substage condenser (1.25) with an associated rotating polarising filter. The analyser filter functions for both lighting systems and can be rotated through 45 degrees to cross with the polarising filters and can be withdrawn from the optical path if required. Good circular stage in good condition and Bertrand lens. There are a few tiny marks on the base of the microscope. A very good specification and price. 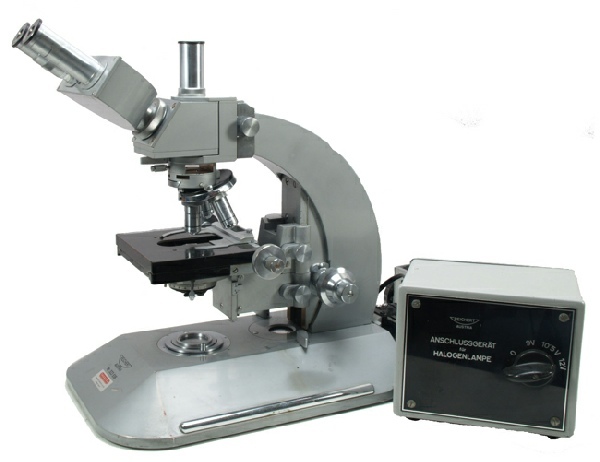 A good example of this popular Japanese made microscope. Kyowa are known for the quality of their mechanical and optical parts and this example is in very good condition with only some scuffs to the stage where the spring loaded slide arm has moved back and forth over the years. The microscope has 6-volt 20-watt halogen light source with the usual brightness control. The stage has drop down coaxial controls with a double vernier scale. There is a focusing condenser with iris diaphragm. Objectives x4 Vickers, x40 Nikon and a x10 and x100 Kyowa with x10 wide field eyepieces. A fine modern styled microscope with carrying handle. A biological binocular high power microscope. This is a sample, NEW, not included in our range only because the specification overlapped too closely with a current model. Abbe condenser, LED variable light coarse and fine focus, drop down controls for slide movement. x10wf, x4,x10,x40,x100,160 mm. A fine microscope at and excellent price. This is a new model used only by ourselves for assessment purposes. A very modern design with some striking coloured features including a carrying grip and a cable tidy built into the back. Critical LED illumination with brightness control. Low position coaxial coarse and fine focus control with tension adjustment and safety stop. Square stage with long drop down coaxial controls. Infinity corrected plan objectives x4, x10, x40 and x100 (oil) with x10 wide field eyepieces. A handsome microscope with a fine optical performance. Used only by ourselves for customer demonstrations, this is in effect and new microscope in pristine condition and still in its original polystyrene shape. The full specification of our SP200 can been seen on our web site at the link below. The Brunel SP-75P specification features include a rotating monocular head with x10 widefield eyepiece and crosshair eyepiece, filter slot to accommodate the quarter wavelength and full wave length retardation plates that are provided as standard with this microscope, rotating graduated circular stage, with clamping mechanism and lateral adjustment which allows each objective to be positioned centrally in the optical path, triple objective turret with an excellent and very positive indexing mechanism, housing x4, x10 and x40 strain free polarising objectives, abbe condenser with rack and pinion focusing, filter carrier and iris diaphragm. The fully rotating polarising filter is housed above the field lens with a swing out mechanism so that it can be removed easily from the optical path. This unit originally supplied by ourselves is in very good condition. Good value. This is one of the great classic microscopes of our time. Built in a modular way these microscopes can be adapted for all applications. This is one of the later models with the 12 volt 100 watt illumination system and has the original Reichert transformer box which is unusual these days. Mechanically this microscope is in excellent condition. The only negative is that there are some marks on the paint of the base. Apart from the microscope is in very good condition. Objectives x20 (n.a. 0.65), x40 (n.a. 0.65), x63 (oil immersion)(n.a. 1.00) and x100 (oil immersion)(n.a.1.25). With x8 plan eyepieces. Kohler illumination and an epi illumination system that only needs the incident light unit. A nice microscope. This is a new instrument and a new model that has been used only by ourselves for assessment purposes. A trinocular polarising microscope with an elegant design and a specification that is outstanding for its price range. Circular rotating stage with centring screws and a four position turret with three of the positions having individual objective centring. Infinity planachromatic strain free objectives x4, x10, x20, x40 and x60 with a pair of x10 wide field eyepieces and a third eyepiece with a focusing cross hair. The polarising filter is attached to the bottom of the substage condenser is graduated and rotates through 360 degrees. The analyser is on a push/pull lever which allows it to be crossed with the polariser and also to be removed from the optical path. Low position coarse and fine focus controls. Retardation plates and quartz wedge. Full Kohler illumination and a phase telescope as an alternative to a Bertrand lens.